The ForumBlog began its life as an experiment in content publishing back in 2010! It has now become the World Economic Forum’s primary content output channel over-taking the public website. Upon relaunch in January 2012 we saw an immediate rise of global traffic of around 300%, and an additional 400% rise by January 2013. The trend was heading towards a million unique visitors a month, in line with the Head of Communications’ objective to build the audience by means of volume publishing and syndicated articles. That meant I had to prepare the platform for enterprise grade reliability and features. 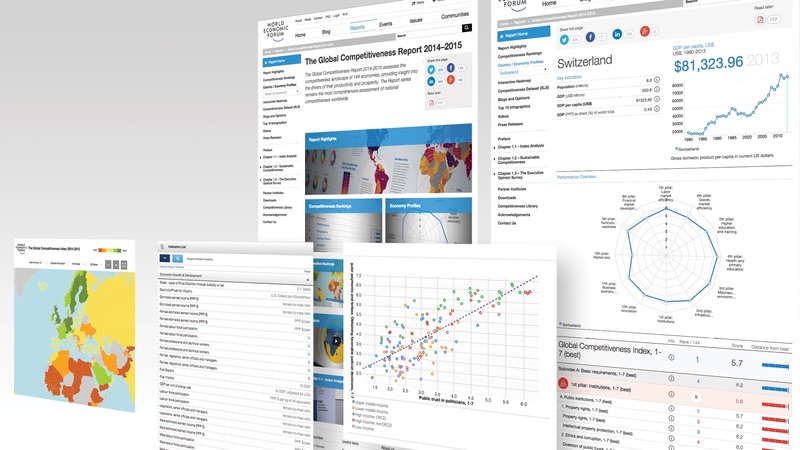 Thanks to the collaborative effort of our Communications department and teams across the World Economic Forum, ForumBlog was awarded Best Community Website in Europe in 2012. And in Davos 2013, Matt Mullenweg, the founder of WordPress (the most used content platform in the world) described it as very impressive. I was responsible for the relaunch of the ForumBlog – leading its design, product specification, and technology build. Until November 2014 I continued to lead its product evolution, managing the design and development team, maintaining its security and performance, and enabling it as our first mobile-responsive and semantic-web platform. I have now moved my focus to other knowledge and data-driven digital products. Getting this level of scale required me to lead the following development work, technologies and features. Security audit. The codebase and server logs needed a full security audit of all known exploit methods against WordPress. A penetration test was also run by our security team. Simultaneously we were getting brute force hacking attempts, which were targeting a bit.ly sharing plugin. Over several weeks we rewrote the vulnerable code and plugins. Performance audit. We installed NewRelic to get analytics – from page load times all the way down to database call efficiency. It highlighted a number of pain points in the code, which caused performance lags. This included a database table that had ballooned to 2GB and slowed things considerably. Server updates. With the number of unique visitors rising, the hosting started to struggle. Our performance audit pointed to a hosting server CPU that was permanently over limit. We reviewed hosting suppliers with an eye on specialist WordPress hosting, scalable cloud infrastructure, and 99.9% SLA uptime. As a result, page load times were 38% faster and the hosting ran at 10% of CPU, which was visibly more performant. I also arranged a follow-the-sun global WordPress technical team to be available during our Annual and Regional Meetings as a first line of support in case of traffic surges or hacking attempts. We successfully called on them several times to scale the hosting, and deal with exploits. Semantic web. As soon as Google introduced their Knowledge Graph, semantic structure became more important for Search Engines. It informs their Knowledge Graph of what types of things that things are. This improved findability and ranking. In our case we have objects like Articles, Authors, Communities, Events with dates and locations, and Topic areas that have structure. To all our web pages we applied schema.org markup in the code, and extended our auto-Topic tagging tools. Social sharing. As well as schema.org we added further structured markup for OpenGraph so that social sharing technologies would share the right title, description and image. This not only helped others to share our material, it gave us control of the snippets of our own that we share as part of our social strategy. Taxonomy-driven templates. Every organisation has a range of Topics that define their strategic interests. I felt it was important to define these for the World Economic Forum so we could build internal momentum around specific subjects. The resulting classification enabled pages to be build with custom headers to explain their value, aggregating all articles on the Topic. 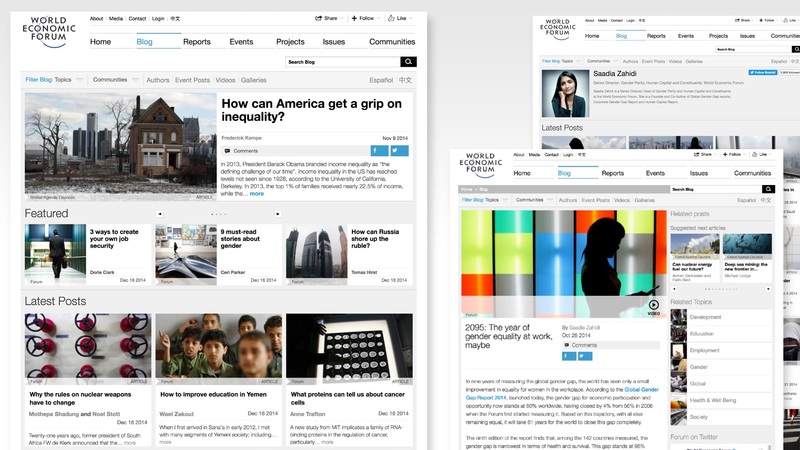 It also enabled us to create pages with themes relating to social campaigns and projects. Image Gallery. Each of our events are well photographed, and our articles with imagery are very popular. I sketched out the layout and features for a highly flexible image gallery. The result was simple yet powerful and highly visual. Its a widget that we can embed in any of our platforms, and receives its imagery via an API from our image server. It has widescreen, fullscreen, and mobile-responsive layouts. And each image is shareable to social platforms with a shortcode URL that deep links back to the specific image within the gallery. We built this ourselves because all available pre-made image galleries lacked the finesse and features that we wanted. Multi-language. With a global membership base, an Annual Meeting in China, a regional meeting in Latin America, and a growing interest in our content from non-English speaking countries, we decided to create parallel versions of ForumBlog. These versions were then assigned to dedicated Chinese and Spanish speaking editors. The published posts were either translated from an English ForumBlog article, or commissioned from members and experts in their original Chinese or Spanish. The re-launch of ForumBlog in 2012 was achieved with a single super-talented external WordPress developer. He continued to evolve the platform with me until late 2014 when I engaged a 10 person development team from an external agency in the United States to take over his responsibilities! To take every aspect of optimisation and security seriously requires specialists in infrastructure, cacheing, code exploit analysis – and then you need to add a project management layer over the top of it. The result of the above work set up our platform for surpassing a million unique visitors a month, with a way higher projected growth curve.